Cascone, Sarah. 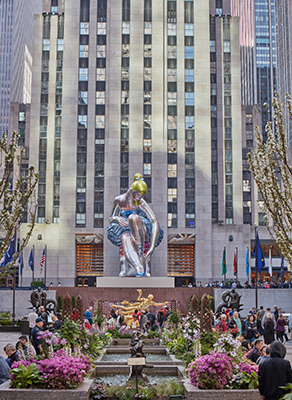 “Jeff Koons Returns to Rockefeller Center With Inflated ‘Seated Ballerina’ Sculpture.” Artnet News 11 May 2017. Grinnell, Sunhee. “Jeff Koons and Kiehl’s Bring the International Center for Missing and Exploited Children into the Spotlight.” Vanity Fair 11 May 2017. Makitalo, Georgia. “Celebrated Artist Jeff Koons Inflated 45-Foot-High ‘Seated Ballerina’ At Rockefeller Center To Offer ‘Hope’.” Inquisitr 18 May 2017. Samaha, Barry. “Jeff Koons, Kiehl’s and the Art Production Fund Fête the Reveal of ‘Seated Ballerina’ at Rockefeller Center.” Forbes 15 May 2017. Speyer, Tishman. 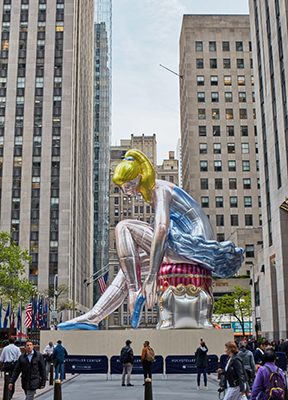 “Kiehl’s Since 1851 and Art Production Fund Present Seated Ballerina by Jeff Koons on view May 12 – June 2, 2017 at Rockefeller Center.” PR Newswire 12 May 2017.